“Benjamin Banneker Memorial,” Histories of the National Mall, accessed April 22, 2019, http://mallhistory.org/items/show/514. In 1996, the Washington Interdependence Council began planning a memorial to Benjamin Banneker, an African American scientist and surveyor who helped map the boundaries of the District of Columbia. Congress authorized the plan, and the Council was responsible for raising money for construction. The initial authorization expired in 2005, but the project was renewed in 2010 through new legislative efforts. The memorial is expected to part of a large-scale renovation near L’Enfant Plaza and Banneker Park. The proposed project includes a 14-foot statue, visitors' center, and a large clock tower. Image courtesy Bobbie K. Carlyle and the Washington Interdependence Council. 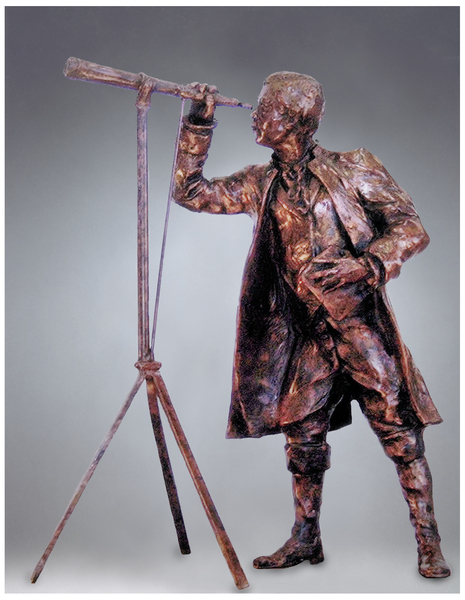 The design of the memorial depicts Banneker looking through a telescope and holding a book. There is also a large clock tower, based on one Banneker designed.